18 resin and 10 white metal parts. 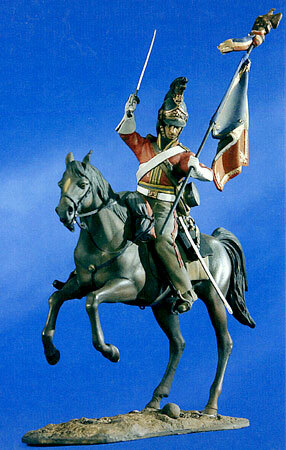 This colourful mounted figure depicts the famous historic occasion when Corporal Stiles captured a French regimental "Eagle" during the Battle of Waterloo. The animation in this figure makes this a superb model for any collection. Napoleon's defeat by Wellington and the British allies at this battle signalled the end for French ambition. Napoleon was imprisoned to prevent any repetition of his escable from Elba.